I don't know if this album will make an impression on metal fan's soul but listening to "Are you there” I’m able to image how the heaven is...the magic atmosphere of this song can't be explained in few words...This is a romantic poetry in which Anathema shows their delicate soul...the sad sweetness into a magic song, that can be composed only with a deep passion …the sense of suffering and the love for deep feelings… only this song is worthy of the price you have to pay for this album. A song that is far from any other band and it shows the original style of this band. This album is very far from what Anathema were, but I think that we've already ascertained that an album like "The silent Enigma" is very far from Anathema's present. This is the 7th album that they bring out and their style is completely different from their first releases. “A natural Disaster” show us another band…A band that has found his maturity! "A fine Day to exit" showed many influences from Emo-rock , and here I notice that these influences are the basis of the structure's songs, but the new songs sometimes goes to new-age, and I notice that all the songs shows the soul of these fantastic musicians..They play in order to show their deep feelings, and It’s notable in all the songs of this album. Vincent's voice gets an unmistakable charm!!!! It's full of intensity and he's very able to give the right emphasis to the songs! “A natural Disaster” gets very good melodic ideas, and all songs gets a personal taste, and a personal approach to the compositions! !” Ok…Not all songs are up to the task, but nowadays Anathema could be appreciated from Mogway and Radiohead fans....and not only…this is sure! 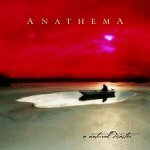 An amazing album that confirms the ability of this band; Anathema plays from the bottom of the heart! Their sadness and that special taste for psychedelic songs could make an impression on Pink Floyd’s fans as well!!!! I want to underline a very important remark: they take only inspirations, but their songs get a personal mark. This is the delicate sounds of rock...this is not a remind to that famous Pink Floyd's title-album, but this is a true affirmation, and in my opinion Anathema are about ready to get success out of metal fans. A song like "Violence" is instrumental song that could be perfect for a film-soundtrack! It last more than 10 minutes, and it shows the sense of soul, the sense of life, a very deep composition that is very far from rock, it's new age! "Childhood Dream" is an instrumental songs that remind of the past....this song makes me dream...it's a shame that it lasts only two minutes!!!... The music remembers a time that will never again be lived....it seems like a tears that falls from the eye......an emotion that lasts only 2 minutes! Les is able to create magic keyboard’s atmospheres...The charm of melancholy is played with a delicate suffering, and sometimes with the sweetness of a meditative piano…”Violence” is the example of this last affirmation. Not all songs get the same charm so that I have to underline that sometimes there are monotonous parts..."Closer" gets me bored; a very prolix song into a not particular emotional atmosphere, but it matters little, the song n°4 is “Are you there”………and words fail me …This song is the heaven in music, Vincent is simply perfect concerning interpretation and intensity. "Harmonium" is a psychedelic song that lacks of melody...but it shows the proper care for the arrangements; I have to say that the production and the arrangements are at the top!!!! "Electricity’s is a pure emo-rock song. It’s very far from other bands and the only comparison that comes into my mind concerning the instrumental arrangements are Travis… This song represents the kind of emo-ballads that Anathema plays...a song seated into an acoustic atmosphere in which Vincent shows his whispered voice; He’s the perfect singer for this kind of songs. The title-track is a slow-gothic song that remind me of the latest The Gathering compositions. Metal seems so far…This song is another delicate moment full of passion and desolation; A good atmosphere around a suffered refrain but on the whole I can’t but admit that because of its prolixity, the song gets me a little bored! “Pulled Under At 2000 Metres A Second” is the only song with a powerful distortion and it’s played with a deep wildness…and for this reason it’s another good track!!!! ...these are simply emotions in music! There are indeed albums about which anything you’d say would be superfluous and meaningless…you only have to close your eyes…listen…and dream!!! Yes, this is the first feeling that “A Natural Distaster” gives: a feeling of oniric bewilderement, where the psychedelic sound merges with curls of prog…completely detaching from the too “extra Anathema” solutions that plagued the previous “A Fine Day To Exit”. This is an album in permanent motion (musically speaking), where even the simplest note creates atmospheres that are a background for doom-like rhythms. Thanks to "A Natural Disaster" the english combo looks to have found its own personality…a belonging, almost parental, even thanks to a line up at last more compact with the (musical) reconciliation of Cavanagh brothers (that also alternate at the vocals). I was talking about psychedelic influences…and I add very sharp influences (but this makes no wonder) from Pink Floyd, extending in the whole progressive landscape of the Seventies to the class-rock, the more refined one, such as Radiohead and company. Overall a slow, smooth and velvet sound enriched by sudden rock accelerations that give to this work a great complexity, managing to satisfy even the more wanting ears!!! Since the beginning the album exhalts and takes off, forewarning with great emphasis (thanks also to a masterpiece guitar work) the following, where instead the more intimate vein of Anathema surfaces, splendidly represented by the refined “Balance”, that manages to create a sort of sympathy between synths and guitars… overlapping images that slip away without disturbance. A more modern and direct sound (in a larger sense) we only find in “Pulled Under At 2000 Metres A Second": scratching and suffered that almost duet with the instrumental “Childhood Dream”, recreating a term-equilibrium that forces us to meditate.